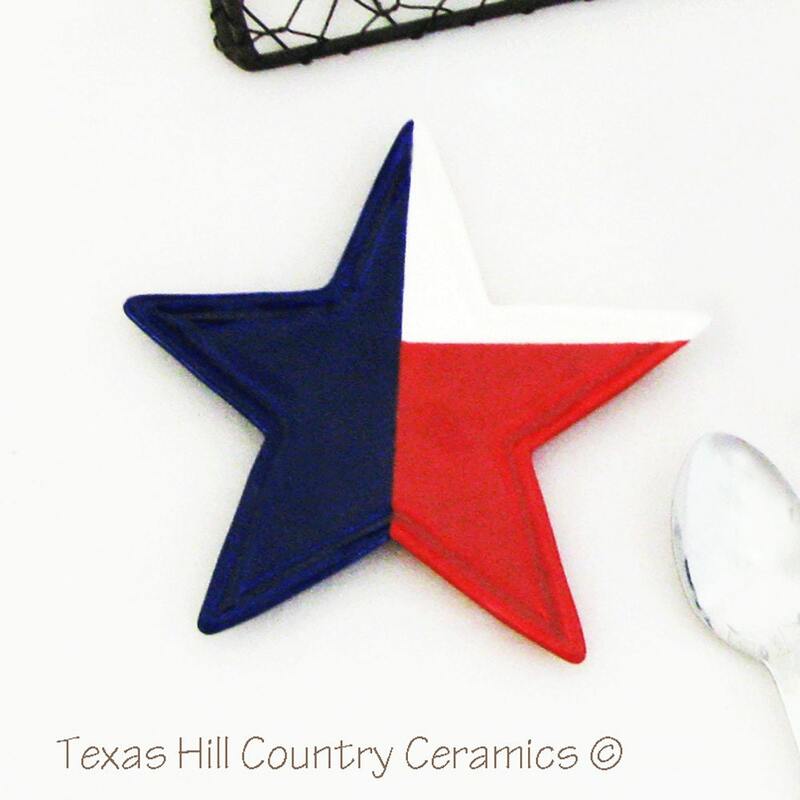 This Texas Lone Star is great for transplanted Texans or those in their home state, it is finished in the Texas flag colors of red white and blue. 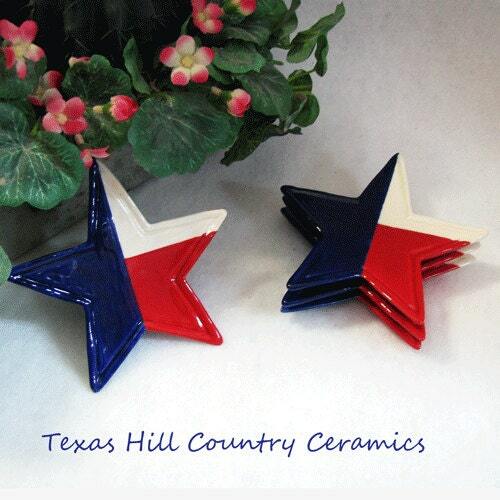 This ceramic star shape is ideal for kitchens decorated in patriotic decor or for Memorial Day or July 4th celebrations. It is also great for gift giving or as party decor. • 4 inches long (measurements are from point to point). 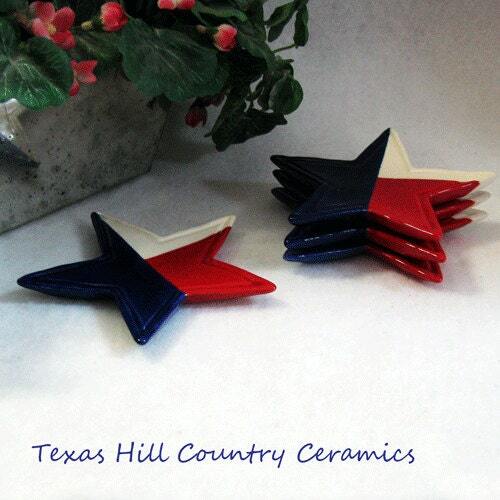 This star is cast from a ceramic mold with domestic clay slip and kiln fired a minimum of 2 times. During the finishing process I use many techniques and products to achieve the final piece you see, all glaze used is from the USA and lead free. It is dishwasher safe and the colors or design will not wash off, fade or peel. This listing is for one (1) Texas Lone Star tea bag holder. Not only does it make a great spoon rest or tea bag holder, it can also be used to hold rings, earrings or jewelry, cuff links or tie tacks, coins or change, desk accessory for paper clips, tacks, staples, etc., keys, mini soap bars, candy, coffee pods, dish scrubber, vegetable brush, sewing items (needles, pins, buttons, etc.,) pet treats, incense, small candles (tea lites), dinnerware place setting accents, wall decorations, Gift Baskets, the uses are unlimited. The star can be stacked on each other as shown in the photo. They also make great gifts so keep some handy for the last minute gift you may need. Great soap dispener & spoon or tea bag rest. Perfect for Summertime & all Patriotic holidays. We are big tea drinkers and he is from Texas so this was perfect. Arrived quickly and in good condition. This will make the perfect gift! Quick delivery time too!